If you’ve ever tried to poach an egg before, you know that it can sometimes be a frustrating process. Here’s the method professional chefs use to make a perfect poached egg. Serve poached eggs on toast (perhaps with Kurobuta bacon?) or add them in soups or other dishes to add richness. We recommend you purchase more eggs than you plan on serving in case one breaks. The eggs being poached here are duck eggs, though the technique works for any egg…some chefs even poach quail eggs (this can be quite difficult because of their small size). Use a thermometer to bring the poaching water to 165 degrees. At this point you should see small bubbles forming on the bottom of the pan, but the water should not be moving vigorously. More heat and you’ll overcook the yolk, more motion and you’ll break up the white. You don’t need a lot of water…maybe a half-inch. The less water you have the easier it is to make any necessary temperature adjustments. Break the egg into a bowl being careful not to break the yolk. The smaller the bowl the better, as you need to be able to gently float the egg in the poaching water. Swirl the water gently with a spoon or spatula and lay the egg into the pot (the swirl helps gather and concentrate the white). 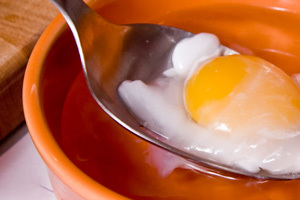 As the white begins to cook you can fold it over the yolk for better presentation. When the yolk becomes slightly firm and the white has coagulated completely (approximately 2-3 minutes) it is ready to be pulled out. Gently lift the egg with a slotted spoon allowing all excess water to drain away. Very interesting. I never thought it was difficult to poach an egg, but to keep the yolk from cooking, I bet it is. Good info. Thanks. To create a stronger water swirl, which wraps the white around the yoke, add a tiny amount of white wine vinegar or white wine. Though it may slightly alter the flavor, it adds a pleasant tang as well. I’ve always added about a tablespoon of white vinegar then covered the pan quickly to generate steam heat to cook the egg faster, and more thoroughly on the top. If it adds any flavor at all it doesn’t detract it at all to me anyhow. Personally I prefer my yolks slightly cooked, just so the yellow is just firm on the edges yet still liquid and somewhat thickened in the center of the yolk. I, like many other folks, have an aversion to runny eggs. If the white has the least bit runny it turns me well off. Interesting method Kris, thanks for sharing!